The 2019 Budget is a precarious juggle that brings together Eskom’s financial and other crises, expenditure pressures to appease constituencies in an election year, and a range of financial indicators that are dour, at best. But if there is a finance minister to deliver a reality check between what’s actually in the public purse against election-year wish lists, it’s Finance Minister Tito Mboweni. Known not to shy away from stating publicly what must be said, never mind the politics, his maiden Budget on Wednesday is likely to deliver some hard truths. Eskom. While Wednesday’s Budget will include a whole range of important information – yes, sin taxes will go up and smokers and drinkers must dig a little deeper into their pockets – the financial woes of the power utility is front and centre because it is the biggest risk to the South African economy. Whatever the Budget wants to do elsewhere, whether bettering schooling, particularly early childhood learning, or in supporting manufacturing expansion through incentives or agriculture and land reform in times of drought, it can only do so after dealing with the Eskom wretchedness. Everyone has kicked the can down the road to Finance Minister Tito Mboweni. That included Public Enterprises Minister Pravin Gordhan briefing MPs last Wednesday amid the load shedding he said in December would not happen again, and Eskom CEO Phakamani Hadebe after the State of the Nation Address (SONA). Even President Cyril Ramaphosa, whose Cabinet would have been discussing Eskom, said in his reply to the SONA debate last Thursday: “… the Minister of Finance will detail the measures that the government will undertake to assist Eskom to stabilise its finances”. It’s widely expected that government will take over several billions of rand – the figure of R100-billion keeps coming up – from Eskom’s R419-billion debt, representing some 8.5% of gross domestic product (GDP) in 2018. This would lower Eskom’s debt and repayment obligations, which the power utility is currently unable to meet without further borrowing. Such a move, called a debt swap in financial jargon, would significantly increase government debt, and push up the debt-to-GDP ratio close to 60% earlier than initially planned. That’s not a good range for any government, as borrowing becomes more difficult and, if approved, more costly and with higher interest rates. But bailing out Eskom means there’s little room for others. Yet the queue is long: water and sanitation, with infrastructure from water pipes to sewage works increasingly in disrepair, action under what’s now called “accelerated sustainable land reform” or education be it from eliminating pit latrines to rolling out the presidential SONA promise of one learner, one tablet and two additional years of early childhood learning. Eskom is not the only State-owned Entity (SOE) in need of assistance. As Gordhan told Parliament’s public enterprises committee last Wednesday, only Transnet was doing “reasonably”. While the SABC is still looking for a R3-billion bailout by the government, the financially flailing SAA must now pay a court-ordered R1.2-billion to Comair in damages for anti-competitive practices, while facing another significant loan repayment date in late March. DA MP and finance spokesperson Alf Lee cautioned there should not be another SAA bailout, given it had received R5-billion in October’s Medium-Term Budget Policy Statement (MTBPS). “South Africa is itself so heavily in debt that it simply does not have the money to continue bailouts of SOEs such as South African Airways,” said Lees in a statement at the weekend. Mboweni’s Budget must deal with a host of unfriendly data. Economic growth is pegged at well below 2% for 2019 across the board globally and domestically. The South African Reserve Bank (SARB) forecast growth at 1.9% for 2019 – it cut growth estimates for 2018 from 1.2% to 0.7% – with National Treasury putting it at 1.7%, after a slight downward revision for 2019. Unemployment remains stubbornly high, despite a minute improvement of 0.3% to 37% joblessness on the expanded definition that includes those simply too discouraged to even try to find work, according to the latest numbers that include the festive season months when retailers hire extra casual workers. The narrow unemployment rate is 27.1%, a 0.4% improvement in the third quarter of the 2018/19 financial year. And Statistics South Africa data released alongside labour force numbers on 12 February also showed retail sales down in the festive season: minus 1.4% in the third quarter of 2018/19 financial year that covers the October to December period. Although manufacturing grew somewhat, it fell way short of expectations, while mining fell by 4,8%, or more than anticipated. Meanwhile, the impact of the 2018 hike of value-added tax (VAT) to 15% “appears to have been less than anticipated”, according to the SARB July Monetary Policy Committee statement. A few months later it emerged that most of the R23-billion anticipated from that VAT hike had gone to settle the backlog of VAT refunds that the tax authorities had let accumulate. The VAT hike, unprecedented in democratic South Africa, was roundly and sharply criticised by civil society, academia and others as disproportionately penalising the poor and vulnerable. There is unlikely to be a repeat in an election year, when also limited is the scope to increase personal taxes of consumers under real pressure given escalating petrol and food prices, alongside above-inflation electricity tariff increases. 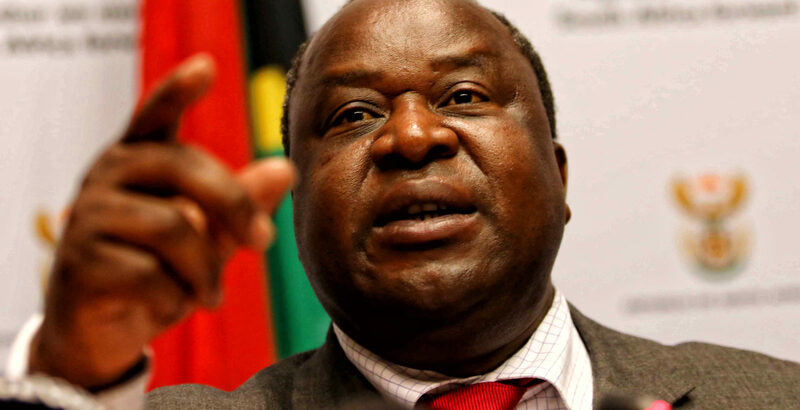 For Mboweni, that leaves hiking the fuel levy, as had the 2018 Budget, and hoping that the additional transport costs spilling into higher costs of, for example, agricultural production and food retail can be mitigated. But it’s not clear exactly how much there is to go around. The 2018 MTBPS could make additional allocations such as to SAA, R1.2-billion to SA Express and R2.9-billion South African Post Office were largely due to government underspending. Effectively, some R32.4-billion was found then by shifting unspent monies around and decimating the contingency reserves, meant to provide for emergencies such as disasters, to R27-million. If underspending and savings from government programmes are to be the source of priority expenditure at Eskom and elsewhere, serious questions must be raised over government effectiveness in planning and implementation, alongside the impact of State Capture. It is against this backdrop that criticism of government’s lack of a plan for Eskom comes from international analysts and rating agencies. Moody’s in its Issuer Comment of 8 February noted “broad proposals” on Eskom, but appeared lukewarm about the power utility restructuring. “This move paves the way for a more transparent group with more clearly allocated revenue and cost between business segments and should facilitate the transition of the sector as it develops new sources of energy supply. However, in and of itself, it does little to address Eskom’s financial challenges,” said Moody’s. That the political heat is on, never mind severely strained public finances, was clear from Ramaphosa’s Thursday reply to the SONA debate in Parliament, when he moved to reassure his internal governing ANC alliance critics, repeatedly, that restructuring was not privatisation and that jobs would be secure. The comments came after protests by trade unions, not only the National Union of Metalworkers of South Africa (Numsa) but also from the governing ANC alliance partner Cosatu through its affiliate, the National Union of Mineworkers (NUM). It publicly said it could not guarantee its members would vote ANC come the 8 May Election Day. In this political juggle, Ramaphosa in his SONA reply also pandered to the National Health Insurance (NHI), a key demand of Cosatu and fellow governing ANC alliance partner, the South African Communist Party (SACP). It’ll be a difficult sell when there’s not a spare cent around, even if Ramaphosa last Thursday argued that the NHI was based on the “the morally compelling belief” that access to quality healthcare cannot be based on socio-economic status, and that the “NHI will bring to life the spirit of human solidarity” through cross-subsidisation. In October 2018 in a briefing after his first MTBPS, Mboweni bluntly said the NHI would definitely be possible – if there was a 2% VAT hike. But that would require political and ideological conversations. With some 10 weeks to go before the 8 May polling day, that’s unlikely to happen.